In clinical practice, doctors and other health care personnel, do not pay importance to the time of administration of anti-cancer therapy. For the convenience of hospital staff, most intravenous chemotherapy is being applied during daytime and, oral drugs, are usually administered once daily, preferentially during the morning, without putting forward a rationale for this time of dosing. Chronopharmacodynamics of drugs in toxicological aspects: A short review for clinical pharmacists and pharmacy practitioners. 2012. Recent studies have clearly demonstrated that administration of chemotherapy agents at the ‘right time,’ cued to the biological rhythms of the host, can improve treatment outcomes and reduce drug induced toxicity and side effects. These studies have been the basis of recent interest in chrono-modulated chemotherapy. infusion of oxaliplatin (peak at 16:00), 5-FU (peak at 04:00), and folinic acid (peak at 04:00) were compared with a constant-rate infusion method. Objective response rate was 51% for chronotherapy and 29% for constant-rate delivery. According to this multicentre randomized trial, therefore, the most active chronomodulated schedule is also the least toxic one. Median suvival was 16 months in both modalities, possibly because 24% of the patients crossed over from the flat schedule to chronotherapy. chronesthesy, and chronotoxicology) of medications, and attributes (period, phase, amplitude, and level) of the human circadian time structure to determine the drug-delivery pattern, dose, and administration time to optimize desired and/or minimize adverse effects . In all living organism, one of the most indispensable biological functions is the circadian clock, which act like a multifunction timer to regulate homeostatic systems such as sleep and activity, hormone levels, appetite and other bodily functions with 24 cycles. The circadian clock system is necessary to adapt endogenous physiological functions to daily variation in environmental conditions. In mammals, circadian clocks influence all major organ systems, and this influence translates directly into disease pathology that also varies with time of day. Biological rhythms not only impact the pathophisiology of diseases but the pharmacokinetics and pharmacodynamics of medications. The cyclic variation in the drug safety and/or toxicity may be due to the cyclic variation of the molecular target or the chronopharmacokinetic of this drug. Drug absorption, distribution, metabolism, and excretion (ADME) are influenced by circadian systems. Drug concentrations in the blood and the target tissue are regulated by these processes, which can be used to determine the pharmacological effects of drugs. Absorption of orally administered drugs depends on several factors such as blood flow, pH, and motility or the emptying level of the gastrointestinal tract. Drug absorption is dependent on the drug transporters expressed in the gut. Several lipid transport proteins including microsomal transport protein, which is important for fatty acid transport, are regulated by circadian clocks, suggesting that lipophilic drugs may also be under their control in mice. As a result of diurnal variations in the functions of transporters and efflux pumps, drug absorption is sensitive to the time of administration. The following three factors may contribute to the volume of distribution of a given drug: concentration, albumin binding affinity, and lipophilicity. The degree of protein binding between drugs varies in a diurnal manner and correlates with changes in plasma albumin levels. The xenobiotic metabolism system comprises three groups of proteins with distinct and successive functions. The first group involves drug functionalization and consists of the microsomal cytochrome P superfamily of enzymes, which have oxidase, reductase, or hydroxylase activities. Many cytochrome P450 genes exhibit circadian expression profiles in mice and rats. The third group contains ATP-binding cassette transporters like multi-drug resistance-associated proteins and P-glycoprotein, which facilitate the transport of xenobiotics from outside the cell. The daily rhythms of the gene expression of ATP-binding cassette transporters were recently reported in mice and rats. The circadian clock system plays a key role in changes in drug toxicity by influencing drug metabolism in the liver and intestine and excreting the metabolites via bile and urine. It is known that biliary excretion of bile acids, lipids, and xenobiotics follows a circadian rhythm, with maximum excretion during the dark period in rats. during the active phase, which is twice the level of the peak seen during the resting phase in human and rats. Circadian systems not only affect ADME, but also regulate drug-targeted receptors, drug-targeted transporters/enzymes, drug-targeted intracellular signaling systems, and drug-targeted gene transcription. 5-FU is a pyrimidine analog widely used in the treatment of a range of cancers, including colorectal, breast and aerodigestive tract cancers ; moreover it is one of the most studied drugs within chronotherapy . 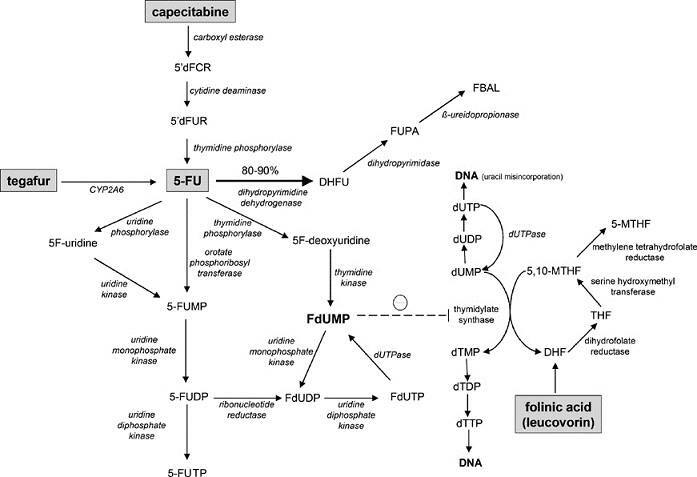 The main target of 5FU is the thymidylate synthase protein; the drug, inhibithing the enzyme, blocks the methylation of deoxyuridine monophoshate (dUMP) to thymidine monophosphate (dTMP) and interfers with DNA synthesis during the S phase of cell cycle. This prevents cellular proliferation. Not surprisingly, 5FU effects are more pronounced in rapidly dividing cells, such as cancer cells, which underlies the therapeutic use of this agent. Healthy but rapidly proliferating native tissue is however also prone to 5FU injury, including bone marrow cells and intestinal mucosal enterocytes. Therefore, most common adverse effects of 5FU include bone marrow suppression and diarrhea secondary to the GI mucosal injury. Tissue TS activity roughly parallels the proliferative activity reported for these tissues with higher TS being associated with tissues with higher S-phase fraction and the relative sensitivity of that tissue to 5-FU damage. In each tissue that is sensitive to fluoropyrimidine drug effects, TS activity varies nearly 2-fold within each day. 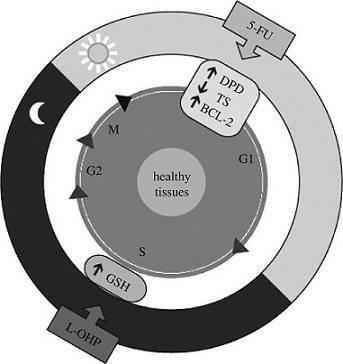 In the bone marrow in vivo, the circadian pattern in TS activity tightly parallels the circadian rhythm in the proportion of these cells in S phase of the cell cycle and is preceded in time by a similar rhythm in the G1-S phase marker cyclin E protein content. The basis for the circadian variation in TS activity may therefore be explained, in part, by the circadian coordination of tissue proliferation. This circadian organization of the primary 5-FU molecular target is likely to explain, at least in part, why fluoropyrimidine timing, within the day, determines its toxic-therapeutic ratio. TS expression peaks at early hours of rest phase, which coincides with the maximum sensitivity to 5FU, higher levels of DPD and lowest rate of GI side effects. Phase I and II human trials have shown that chrono-modulated administration of 5FU, with the maximal dose administered around 04:00 AM, results in an improvement in the objective response rate (53% vs 32%, P= .038) and survival (19 months vs 14.9 months; P= .03) compared with constant rate infusions at the same total dose. Also, severe stomatitis and diarrhea, that are other dose limiting toxic effects of 5FU, were observed 5 times less commonly in chrono-modulated group. This allowed for a dose intensification protocol in the chrono-modulated group (median 5FU dose: 700 mg/m2 per day in chrono-modulated group vs 500 mg/m2per day in conventional regimen cohort). Dihydropyrimidine dehydrogenase (DPD) is the rate-limiting enzyme in 5FU breakdown, and plays an important role in the anti-cancer efficacy of this agent and in the better outcomes of chronomodulated therapy. A recent study suggests that DPD is a clock-controlled gene and its expression is correlated with Per1 mRNA expression. DPD is reduced in malignant colorectal cells, compared to normal mucosal counterparts, which leads to higher concentrations of 5FU in the tumor tissue and helps the specificity of the agent for the malignant tissue. On the other hand, in cells from metastatic colorectal cancer, DPD mRNA levels are significantly higher than the non-metastasizing tumor and the mRNA content is inversely correlated with 5FU sensitivity. Patricia A. Wood et al have shoen that there is a circadian rhythm also in the expression of WEE-1 (a cyclin-dependent kinase inhibitor that causes cell cycle arrest at G2-M interface) and VEGF (vascular endothelial growth factor that plays a key role in tumor-induced angiogenesis) regulated by BMAL-1 protein nuclear traslocation (mettere colegamento con altra tesina). Futhermore this circadian trend has an influence on the effects of the 5FU. The best time of day (early activity, 2 hours after daily arising) for 5-FU administration (low host toxicity and high tumor response) is associated with the maximum daily tumor nuclear BMAL-1 protein content and total cell WEE-1 protein concentration, which is coincident with lowest daily average tumor size and VEGF content as well as the lowest daily tumor TSA. The worst time of day (late activity) for 5-FU (high host toxicity and low tumor response) is associated with the minimum daily tumor nuclear BMAL-1 and total cell WEE-1 protein content, which is coincident with the highest daily tumor size and VEGF content as well as the highest daily tumor cell TSA. Despite its success in clinical trials, chrono-chemotherapy has not been widely accepted in clinical practice, in large part due to the inconvenience that is inherent to it. The ability to modulate DPD rhythms such that tissue expression is shifted to a practical chemotherapy administration time, could improve acceptance of this practice.